When the Night Lords legion trait was revealed I was super excited, it fit the flavor of the army and seemed like it would work in a world where Ld 10 wasn’t common. I even didn’t mind having to give the Mark of Nurgle to get access to the Icon of Despair. After a few attempts at lists I gave up because any “trick” that can be negated by 2Cp isn’t really going to work out reliably. 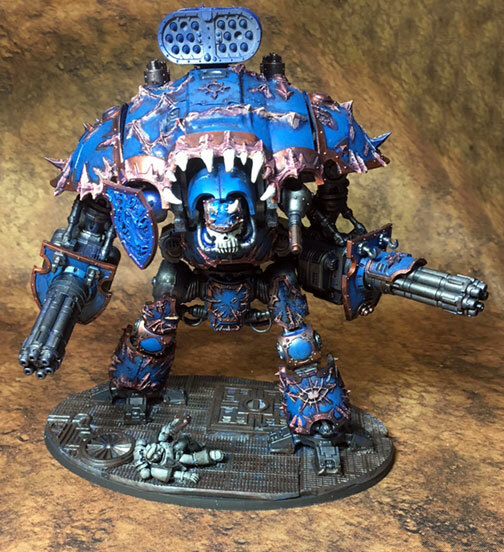 After digging through my cabinets of chaos models I settled on running a Renegade Knight as my warlord with a battalion of Slaanesh Daemons and an outrider detachment of Night Lords. It seems solid and what follows is the backstory I’ve come up with. The Knight World of Scelus Six was originally colonized as an agri-world sometime in millennia past. While clearing the lush jungles of giant beast and making way for industrial farming activity rare gems and ore were found in the volcanic soil. The ensuing strip mining efforts destroyed any hope of industrial farming, in fact a native plant know for it’s narchotic effects was the only thing that would grow in the displaced soil. Over time Scelus Six became a haven for rich nobles and criminal organizations looking to capitalize on the lucrative export of luxury items throughout the edges of the Imperium. The Knights of Scelus maintained their noble traditions under the watchful eye of the High King even though finding suitable recruits was becoming difficult. The constant influx of off-worlders filled the heads of able bodied citizens with delusions of grandeur and many left to pursue loftier ambitions with more reward than patrolling a backwater world or being sent off to die in one of the nameless crusades that continued to claim noble knights. The High Kings son, Greyson was a weakling born frail and sickly he never followed the noble pursuits of his elder brothers and instead chose to learn about the darker side of his home world and how he could use his standing as a Knight Baron to satisfy his unusual appetites. After the Great Rift appeared in the sky Greyson became more jealous of his brother who would one day soon take over the household. One night when the glow from the Rift was bright in the sky, Greyson and his concubines snuck off to one of his secluded dens of debauchery. The levels of depravity he and his loyal retainers sank to caught the attention of one who promised to show him the secret to happiness and revenge. Upon his return to the Keep, he sacrificed slaves and performed the rituals as instructed. With the Great Rift glaring down upon him he watched as his brethren were slaughtered in their sleep. 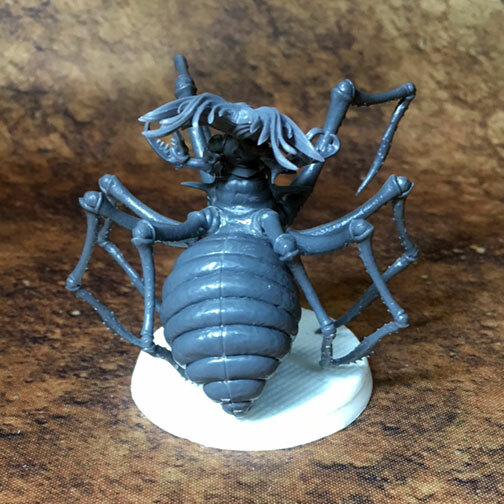 Before their corpses were cooled the Keep was flooded with revilers who’s sacrificed birthed forth more and more of the Dark Prince’s minions. Sallying forth with his band of followers the Baron cut a swath through the darkness claiming souls for his Prince. During a particularly brutal engagement against a convent world the Baron joined forces with a small fleet of Night Lords. Seeing kindred spirits in the Midnight Clad masters of the Macabre he found himself working with them more and more often. During a particularly brutal engagement the Night Lord fleet abandoned anyone planet-side to avoid destruction by the crusade force their seers foretold as arriving soon. The Imperial might came down in force and the Baron was forced to flee with his renegades. Abandoned and left for dead the Lord of the Raptors has thrown his lot in with the Baron and his Daemonic patrons for the time being, so long as there is terror to sow and blood to shed.